Early on Tuesday, February 19, we left Haast to ride up New Zealand's West Coast. This region is noted for heavy rainfall and strong winds, but so far the weather has been fair with light breezes. Also, the notorious sand flies (like our black flies) haven't bothered us at all. Of course, we're only about a third of the way up the coast when we write this, so we should be knocking on wood. The road touched the coast at Ship Creek (below), where there was a long, gravel beach. There were high clouds and it was cool for swimming, but we checked the water and were amazed that it was reasonably warm  or at least not terribly cold. There was some tough climbing up and down a set of three hills, with grand views from the last of them, Knight's Point. After zooming back down to near sea-level, we rode along the shore of Lake Moeraki, an exceptionally beautiful part of the route. A bit farther along, we stopped at the Lake Paringa DoC campsite to fix lunch and met the young Swiss cyclists, Martin and Francesca. There were also three exceedingly friendly Korean men at the campsite, the eldest of whom was a Presbyterian minister, who wanted to trade photos and addresses. We will have a place to stay if we ever go to Korea! After 87 kilometres of riding, we ended our first day on the West Coast Jacob's River. We camped at the Pine Grove Motel, the only business around. It was a small but clean and well-run place, with a cheery, friendly hostess who gave us free milk. The same cycling gang was there again  the Swiss couple, and the tandem riders from England, Dave and Jo. There was also a very nice Swedish couple who had sailed to New Zealand  in fact they'd been sailing for nine years  and were touring the South Island by car for a while. 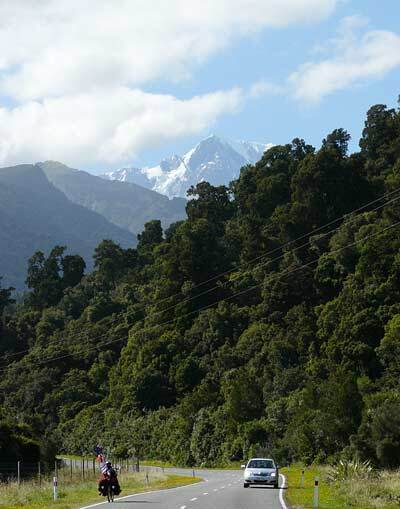 On Wednesday, February 20, we rode from Jacob's River to Fox Glacier and Franz Josef Glacier. It was only 67 kilometres altogether, but if you flattened it out, it might be much longer! After perhaps 40 kilometres of mostly easy cycling, we had our first glimpses of the snow-capped mountains around Fox Glacier. We noticed a little dirt lane with a sign saying Glacier View, so we decided to try it. The surface was fairly smooth and well packed, but at times it was steep. After three or four kilometres of climbing, we reached a parking area. There were fine views of Fox Glacier, and also a walking path through the native trees and ferns that we love. Right is a view of Fox Glacier from the Glacier View Road. 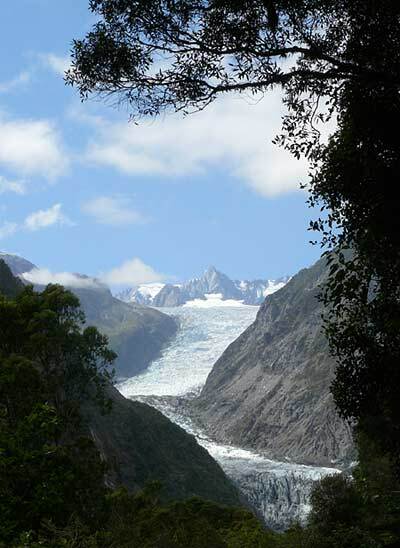 The village of Fox Glacier consisted of businesses designed to empty tourists' wallets: guided glacier walks, van outings, scenic flights, helicopter hikes (where you're dropped by copter at the top of a trail and hike back) and no doubt much more. We decided to carry on to Franz Josef, a slightly bigger town of the same sort, also with an impressive glacier and many expensive outdoor activities. Between Fox and Franz Josef, there were a series of three hills, one after another, and each of the first two hills required steep ascents and descents of 200 metres. At the bottom of one of the hills, we met a Polish cyclist on his own, and while we were chatting, three young Dutch cyclists arrived on the lowest recumbents we've seen yet. They are on a long tour through Australia and New Zealand, and they have a website: www.10000km.com. With the side trips and chatting, it was after 5 pm when we arrived in Franz Josef. All indoor accommodation was filled, and the tenting site we'd have preferred was taken as well, so we ended up in a Top 10 Holiday Park. These places are reliable, but they command higher prices than the competition  typically over $30 just for a tent site for two  only because of marketing, not because of superior facilities. Anyway, it was a perfectly fine place to spend the night.